Are you tired of the irritating, lengthy advertisements at the begging of all YouTube videos? In this case, YoutubeAdblocker may seem like the right application to install onto your Mozilla Firefox and Google Chrome browsers. You can be sure that this is not the program you should trust because our researchers have analyzed it and discovered that its main purpose is to distribute/promote third party applications. The official web page representing the supposedly authentic program is youtubeadblocker.com. If you click the download buttons indicating that you are acquiring the ad blocker, you will be offered to install Smart Media Converter or other unrelated applications. We do not recommend installing any suspicious, unfamiliar software because it could be malicious or could travel bundled with malware. Of course, you should remove YoutubeAdblocker if it is already running on your web browsers. It has been discovered that if you are quick enough, you may think that you are circumventing the installers of third party offers. 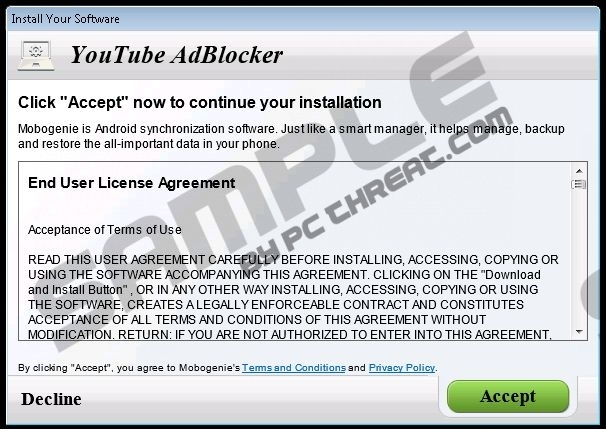 Nonetheless, if you click the YoutubeAdblocker download link which only appears for a brief second, you will be presented with yet another fictitious installer. This one will push you to install the unreliable DefaultTab; however, you are given the chance to refuse this program, and this is exactly what you should do. Unfortunately, if you complete the installation, you may discover Mobogenie installed onto the computer without your knowledge. It has been discovered that this application often travels bundled with other software, which is why we categorize it as a potentially unwanted program. Nonetheless, you may need to worry about YoutubeAdblocker removal if you install the GreatSaver browser add-on, as it comes bundled with it. Overall, it is clear that the program runs in a suspicious manner, and so getting it deleted from the operating system is strongly recommended. If you are worried about your virtual security, we advise that you delete YoutubeAdblocker from the PC as soon as possible. If you have attempted to install the application but instead acquired various unfamiliar and undesirable programs, you should delete these as well. You can follow the manual removal instructions below to delete the clandestine threat; however, these guides cannot guarantee that all files, adware components or registry entries related to the undesirable software are deleted as well. This is why we suggest installing automatic malware detection and removal software to ensure that all threats are deleted and that the operating system is protected in the future. As the menu pops up select Control Panel. Find the undesirable application and select Remove. Open the Start menu from the Task Bar. Select Uninstall to get rid of the undesirable software. Select All apps and then open the Control Panel menu. Click Uninstall a program and find the undesirable application. Quick & tested solution for YoutubeAdblocker removal.